The Supreme Court on Monday finalized an 18-month prison term for a former head of the now-defunct Hanjin Shipping Co. for selling off her family's stake in the firm using insider information. 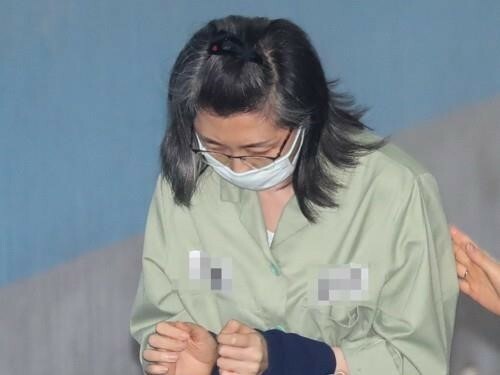 Choi Eun-young, 56, was convicted in December last year of unloading the stakes held by her and her two daughters after she learned that Hanjin's creditors decided against the additional liquidity support. She avoided about 1 billion won ($875,270) of possible losses. She was imprisoned following the court verdict. The top court also upheld a 1.2 billion-won fine and a 490 million-won forfeiture order the appeals court ruled for Choi. In April 2016, Hanjin Shipping filed for court receivership after failing to deal with its mounting debts amid a protracted global downturn in the shipping sector. The once world's seventh-largest shipper was declared bankrupt by the court in February after its creditors rejected to let the firm proceed with its salvage plan.